This hoody fits about like we’d expect for “normal” US men’s sizing. We measured a selection of sizes and also tried these on our fit test mannequins. Huey is wearing a medium and Dewey is in the XL. These are the sizes they normally wear. The fit is looks good. I’d advise to choose the size you normally wear in men’s clothing. This hoody is stretchy and generously sized so if you are between sizes, I’d suggest choosing the smaller. To make size selection easier, we’ve developed the chart below to help you choose a size based upon your chest and belly measurements. If you have a bit of a belly, just make sure that the size you choose will be big enough for both your chest and belly. Note: if you plan to add a back protector to this hoody, then add 1” to the chest/belly measurements before choosing a size. 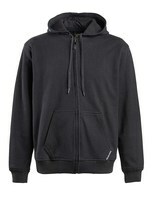 As hoodys go, this Vincent hoody is the most protective of any we carry (to date). It is shell contains Cordura and the liner is Kevlar reinforced and will accept a full set of armor. The shell of this hoody is Cordura reinforced cotton. You can feel the difference as compared to just any old cotton hoody… this material feels a bit stiffer and more substantial. And the liner of the hoody is black fabric that has Kevlar reinforcements. I don’t want you to get the idea that a reinforced hoody like this will do as well in a slide as a regular Cordura jacket, but having the reinforcing features is far better than having none. A plain cotton hoody or shirt would no doubt shred immediately if you fell. This hoody has provisions for the addition of both back armor and elbow/shoulder armor. The armor is made by Forcefield and is nice stuff. The armor pieces themselves are a three ply arrangement which allows them to flex and mold to your body shape easily. Roland Sands says: Imagine your favorite hoody with enough built in protection to ride in. The Vincent Hoody is just that. The outer fabric is a Kevlar Coolmax blend that provides abrasion resistance and moisture control while the liner is a Cordura Nyco material that increases slide protection. The Vincent also features a hidden zipper pocket in the kangaroo pouches and a heavy duty YKK aqua guard main zipper.